If you're a fan of the Gorillaz, don't forget to check online for an additional present this Christmas Day. The band has always been known for seeking out ways to set themselves apart - which leads us to the digital Christmas gift of the album "The Fall," now available to listen to online on the band's site. And by the way, it was composed using mostly an iPad, with just a few other instruments. You'll need to have a membership to their fan club to download the album, but anyone can listen for free. The album will also have an official release, and hard copy, next year. The album has a much slower and more basic vibe than the Gorillaz' normal high-production, technically superior collections. But considering the band had just 32 days to make the music, with the added task of composing partially on an iPad, you can't help being at least a little impressed. The use of the iPad was partially what led the band to record an album quickly in time for the holidays. "I hope I'll be making the first record on an iPad," frontman Damon Albarn told the UK's NME music website back when he first began recording. "I fell in love with my iPad as soon as I got it, so I've made a completely different kind of record." "Speak It! / SoundyThingie / Mugician / Solo Synth / Synth / Funk Box / Gliss / AmpliTube / Xenon / iElectribe / BS-16i / M3000 HD / Cleartune / iOrgel HD / Olsynth / StudioMiniXI / BassLine / Harmonizer / Dub Siren Pro / Moog Filatron"
So, music fans, take a fresh listen, or break out the new iPad you just unwrapped and start making your own album - you know, either because you're a digital music-making fan, or because you want to drown out that loud family member in the other room this holiday. Who knows, maybe you too will have your own iPad band like these guys soon. great band. Amazing that it was recorded so quickly. Artists need to take a cue from this. No reason to take 2 to 3 years between albums. No longer tied to a recording studio...it is mobile. And making it free for fans will only get the music around to more people to discover it. I love the Gorillaz and I'm quite the fan of Apple innovation! This is such a treat! Thank you! I appreciate that you have spent a long time learning to play instruments and make music. I can play a bit of guitar and a bit of piano (very basic) and I make electronic music on my laptop and iphone and ipad. YES, the iPad and all this new tech is making it esier for anyone to make music. YES it requires no talent in most cases as apps are set up to sound good without any leaning curve.. BUT... don't be offended by this! You are just looking at things wrong way at the moment. Think of it this way, if today's generation is growing up thinking that playing an instrument is playing with an ipad, that will make REAL musicians more unique. There will be LESS people playing real instruments in the future, which means that you will get more attention as a result. People will watch you in amazement thinking hey this guy can play THE REAL THING. And people will still go to see live musicians because it will be like a novelty to see someone be able to perform. Hang in there and don't panic! Embrace technology.. when you're stuck in a rut with the same old gear and the same old ideas, sometimes the best thing is to try something new and different like playing instruments on a mobile phone! you never know, you may accidentally stumble upon the best idea you've had in a while!. continued from my last blog* they have a shred of talent but not much and are indeed washed up. this may be a marketing scheme for both parties or may just be an article written by a journalist who is a big fan of both the Gorillaz and the Ipad. i just hope this new trend doesn't wipe out the already dying class of true die hard working class musicians who know the true sacrifices that are made being a real instrument playing musician. seriously at this new tech music crap rate, next thing you know you will be watching live video broadcasted concerts over the internet and through ipads and such. All of this is an utter insult to real musicians. the rest of you bloggers can talk all the crap you want about my blog, to each their own, it wont offend me nor cause a digital retaliation from me because im better than that. my intentions are just to voice my opinions. happy new year to you all. What was that earlier post about any artist making money off their craft is a sellout? Methinks thou protests too much! argument, anyway. Most old-school musicians are resistant to any kind of change, anyway! Guys, why you are so mean and unfocused. Gorillas did it first, after them somebody else will do the same thing. I-pad is amazing product, and that's why entire album was made on it. 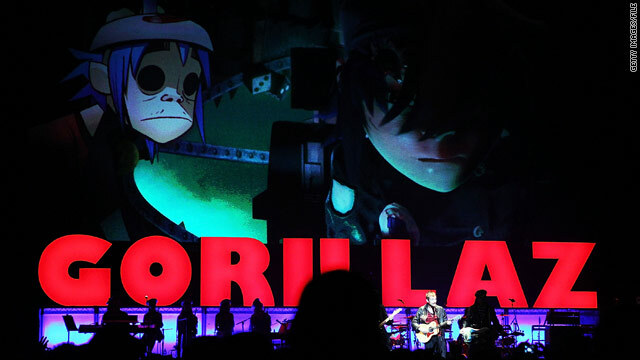 I am really glad that gorillaz did their album, not some stupid gaga/bieber people. It is truly a nice and helpful piece of info. I am satisfied that you shared this useful info with us. Please stay us up to date like this. Thanks for sharing.